Expand search to view more listings in and around Coral Gables. See more offices in and around Coral Gables. Offices.net has [number] office building[s] with a variety of business space available for you to rent on short term, flexible contracts in Coral Gables, FL. The private and shared office suites and coworking spaces are available right away, and come fully furnished and wired, ready for you to move in and get to work with little or no downtime. Most of the business centers listed on Offices.net come inclusive of an outstanding array of support services including dedicated front desk reception and building security, conference suites and lounges, dining facilities and break out areas. In addition, most of the office buildings also include internet and network wiring, parking, 24/7 access and onsite IT support staff. The local office market consists of approximately 11 million square feet of space and enjoys a fine reputation as one of the top office locations in Southern Florida. Over 150 multinationals have already chosen Coral Gables as their base, many of which take advantage of Florida's position as a gateway to Latin America. Yahoo, Britvic, MoneyGram, IBM, Marriott, Cisco Systems, and Diageo are a small sample of the typical office occupier profile in the city. Vacancy rates are in line with the county average (12 percent and generally stable), and so are asking rates, which in 2017 were $38 / sq ft / year for all classes and $42 for Class A space. This makes Coral Gables one of the priciest suburban markets in the Miami - Dade area, since rates are only higher in Miami Beach and Northeast Dade. Coral Gables is a planned city with strict zoning regulations, so new real estate developments are limited. However, several office construction projects are planned north of downtown and near South Dixie Highway. Shared office space operators have been behind some large transactions in Coral Gables, and the trend may continue as there is sufficient demand for suburban coworking space throughout Miami - Dade County, and this may offset the limitations caused by planning restrictions in the near future. Coral Gables is a medium-sized city located in eastern Florida, approximately 6 miles south of downtown Miami. The city belongs to Miami - Dade County, which has a total population of nearly 3 million people. The city is a prime tourist destination thanks to its seaside location, and the visitor economy also supports related sectors, such as retail, accommodation, and hospitality. Other important industries are medical research, import and export activities, international finance, real estate, and media. The largest employers are the University of Miami (which has two campuses in Coral Gables and overall provides employment to more than 13,000 people across the state), Bayview Financial, the Biltmore Hotel, Mercantile Commerce Bank, Bacardi, Mercedes Benz, and Del Monte, along with several healthcare providers such as Baptist Health and Coral Gables Hospital. The local labor market benefits from the presence of graduates from the University of Miami, which has been ranked as one of the nation's top graduate schools and is a renowned research institution in areas like medicine, engineering, education, and marine sciences. Nearly 60 percent of the local residents are educated to at least university level, and approximately 50 percent of the workforce has second language skills. The Coral Gables business community consists of a mix of local, national, and international firms that enjoy easy access to the second-busiest international airport in the US and to the business district in downtown Miami. Other key advantages of being based in this city include favorable tax rates and easy access to a talented local workforce and to large international markets. More information on the steps to follow to open a business in Coral Gables is available from the city's Planning and Zoning Division. We would love to help you find the perfect workspace solution. Simply choose your favorites from the listings above or give us a call on 1800 038 940 and one of our Coral Gables experts will be happy to provide advice and search services at no cost. 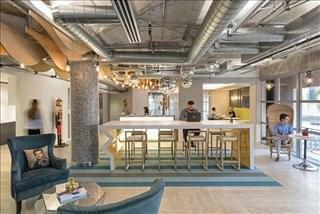 In addition to executive office suites and commercial office space, we also able to help you find coworking and creative work spaces, hot desking, short term offices and virtual office solutions in other cities throughout Miami - Dade County and Florida. Contact us and we will do everything we can to help you find your perfect office space.